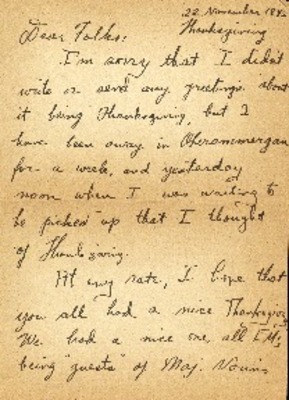 Davis apologizes for not sending a letter for Thanksgiving, and explains that he was in Oberammergau. Capt. Norine hosted a party in the afternoon, and afterwards, Davis and Brady visited Runte's and Sonner. I’m sorry that I didn’t write or send greetings about it being Thanksgiving, but I have been away in Oberammergau for a week, and yesterday noon when I was waiting to be picked up that I thought of Thanksgiving. At any rate, I hope that you all had a nice Thanksgiving. We had a nice one, all EM’s being “guests” of Maj. Norins to a party in the afternoon, following which we had a rather mediocre dinner as go, but still a good meal. We all ate around one big table, “T” shaped. It was a very neat occasion.